Fast forward 20 years and we decide to try the same concept with pancakes. This place has no reservations and it has huge waits. We arrived on a Saturday (I know crazy day to try it) and had a wait of 45 minutes for 6 of us. What I really appreciated is that they text you when they are ready, so we wandered around and kept ourselves busy. Pick your batter (Choices as of Sat- Buttermilk, Whole Wheat, Gluten Free, Parsnip, and Peanut Butter). Each bottle is 8 oz, and it is suggested 1 bottle per person and is $6.50. Pick any toppings, to add to the top of your pancakes if you wish. We also ordered a few things off the menu that they prepare like the Eggs Benedict. (I know, I can’t go anywhere and not order an eggs bennie if it’s on the menu.) The pancake makings come out rather quickly. My husband wanted to wait until my food arrived, but I told him to start. Good thing I did because our griddle was so slow that those pancakes took forever to cook. My Eggs Benedict came out as they were all taking their first pancakes off the griddle. 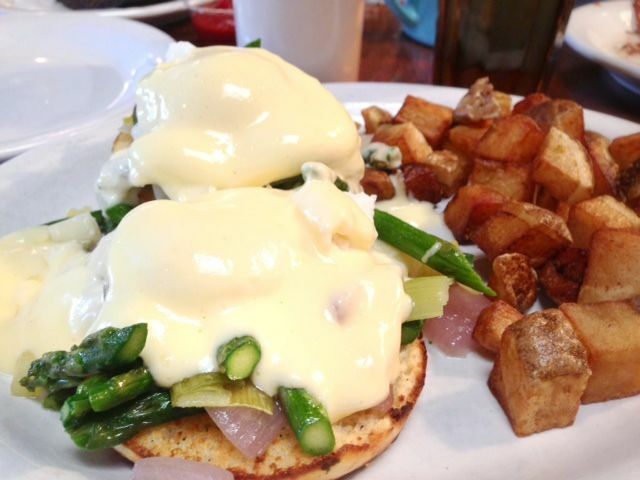 I had ordered the veggie bennies with roasted asparagus and onions. Wow, those onions were sweet. My dad would say, “It tastes just like candy.” They truly did taste just like candy. The Hollandaise sauce really didn’t have a flavor, if that is at all possible. Very bland, but the toppings salvaged the dish for sure. They also placed the bennies on top of house made English Muffins, which were the bomb by the way! 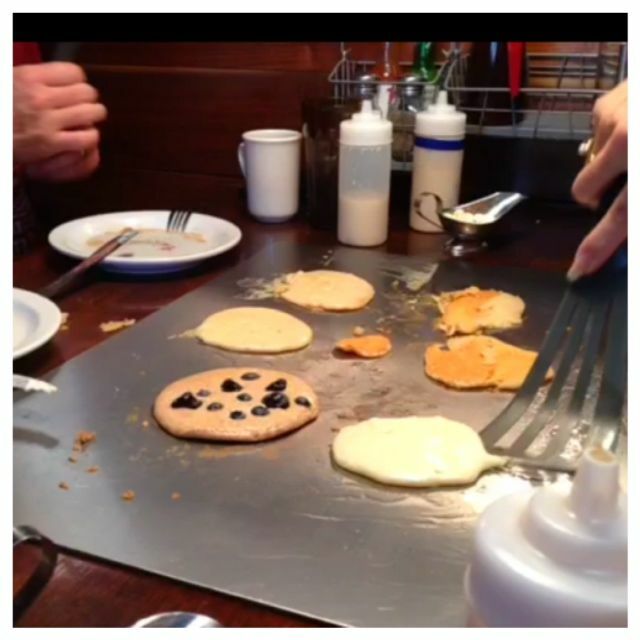 Let’s go back to the pancakes…..We were warmed that the outsides were much cooler, so cook in the middle. We had 4 people trying to make pancakes in the center area. We started by making them too thick, even though they weren’t. You had to make them crepe thin in order too cook. Our griddle was a mess. It was a cross between impatience and low griddle heat. In the end we also ordered too much batter. You are only allowed to take home cooked pancakes. It was taking so long to cook them up we finally bailed on the unused batter. This place has a crazy long line. I am pretty sure we won’t be back to cook our own food, which is totally fine. Many people there were having the best time and we just won’t be adding to your future wait. I am glad we tried it. It has been on my list for quite some time. Don’t rule it out because I didn’t like it. I guess when I go out to eat I just like the whole experience of them cooking and cleaning up for me. Atmosphere was very open and very clean slick lines. Each table has it’s own griddle. Pricing was average I guess. I would say order less than you think, because they can bring more out rather easily. Service was outstanding! She went above and beyond to make sure coffee and water was always full and make sure we didn’t need anything. Our server really helped salvage what could have been a really bad experience. She even tried to help get our griddle hotter, although I don’t think it worked. Coffee is Stumptown and Tea is Foxfire. Both of which are favorites in our book. 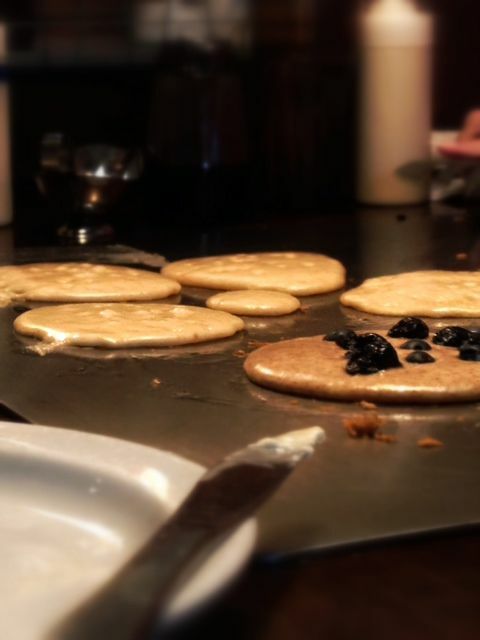 Slappy Cakes is located on Belmont Street. We went here for fathers day and the line was killer, but luckily our son came early and got in line for us. We lucked out on got the table in the back private room. We felt like VIP. The food was amazing. We had the “tis the season” pumpkin pancakes, mama’s french toast, tequila sunrise eggs, and the Shrimp BLT. Everything was so good and the wait staff was awesome. We all had so much food left over to take home. We will definately come back again. Only gave four stars because of the long wait.